Compared to freshwater fish,saltwater fish is much more in terms of category and quantity. The speed and strength to fish marine fish are very large, so fishing in the sea is considered to a thrilled sport. Currently, the movement of fishing in the sea is lively than ever before. Many people like to go to the offshore to enjoy strong feeling of the ocean’s fishing. However, if you go first, less experienced anglers will encounter many difficulties, even though they own the best fishing rod. Therefore, it is essential for the fishing beginner to know some tips in order to fish effectively in the sea. Take the anti-seasick medicine 30 – 60 minutes before boarding the ship and take regular 6 hours / times for the next times. If you feel heatstroke, lie in the board of the vessel and take a tablet Hydrate. When you are strong again, continue to fish.you always wear polarized sunglasses to protect the eyes. Moreover, listen to and follow the advice of the captains, they are very experienced on the fishing spot as well as fish. The best time for fishing is a half to 2 hours after low tide or high tide. Fishing in the early morning and late afternoon are most effective, fish are less active under bright sunlight. If you select the type of living baits, use raw fish for bait, you will receive great results. The bait of live squid is very effective. Please check the bait frequently, every 10-15 minutes to make sure that the bait is alive. With the fishes that have sharp teeth such as barracuda, mackerel,you should use a wire leader. To avoid sticking to the coil, tie the rotated eyelet to the axis. Another thing is to always to check the first few meters of fishing line after every fish hooks. 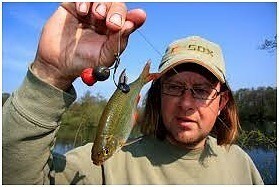 Don’t forget to use circle hooks will be easier to attach the fish or remove it. It is necessary to check a drag before throwing line. Be sure drag is in a suitable state to throw line easily and smoothly. Besides, select the best fishing rod that has leader or fluorocarbon leader to catch the mischievous fish. When fishing in a new fishing spot, always listen and learn from local anglers. Also, if you want to know more information, go to the shop of fishing equipment in this area. The fight against marine fish is tough and fierce, so do not skimp when buying hook, line or rotated eyelet. Buy the best types of the famous brand because they are more reliable than the cheap or no-name one. Click here If you want more information to take a best fishing rod. Not only the rod, the websites of fishing equipment supply much useful information for customers to help them make the best choice.